One of the highlights of my week is gathering around my gaming table on a Friday evening and moving troops on the table. Sometimes well intentioned plans for an historical refight don’t eventuate but that’s when a more general points based game is ideal. 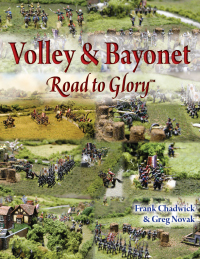 The Volley & Bayonet “Road to Glory” scenario system is excellent as it creates a scenario with little preparation. Last night’s engagement was no exception. Three of us opted for an 1813 encounter between French and Prussians. Both armies had drawn reasonably high deployment cards. From a game perspective this meant that both armies were concentrated and their commanders believed they each had the burden of attack. The battlefield was reasonably open with several light woods at various points. The dominating features that marked the battlefield could best be described as follows. On the French left a small hill provided a defensible position which protected the French left flank and the French line of communication. This road continued across the between both armies at a gentle angle, from the French left to the Prussian centre left. Two towns sat astride the road and one would feature significantly in the battle. 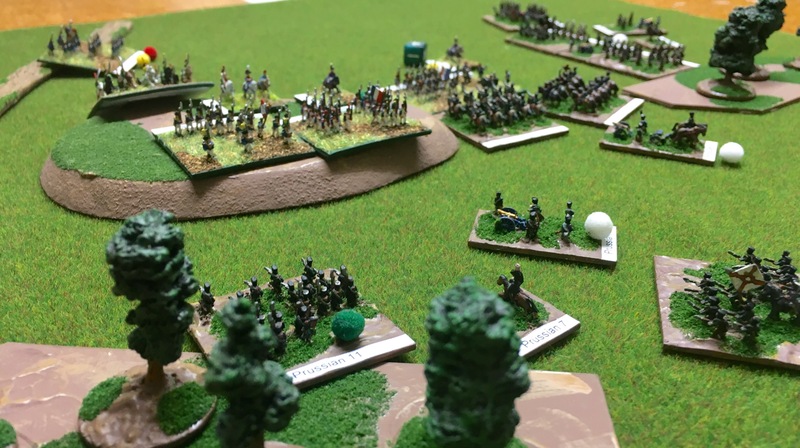 On the Prussian left a dominating ridge lay equally between both armies. The Prussians deployed two corps, the II Corps making up the centre and left while the III Corps the right. The Prussians generally had a numeric advantage, their divisions being larger and containing troops of various quality. In contrast the French had the advantage in quality, with generally more well drilled troops, but the number of bayonets in each division were smaller. The battle opened very late in the August afternoon, with only a few hours of daylight remaining, with a general Prussian advance. On the Prussian left von Preussen’s division advanced to secure the dominating heights. As they did so two French infantry divisions countered. An early cavalry encounter between French hussars and Prussian dragoons caused some concern among the French infantry when the French cavalry collapsed. The French infantry however closed ranks and continued to dominate the musket and artillery exchange between the infantry. After two hours von Preussen’s Division fell back towards the town of Laswitz covered by Prussian dragoons. 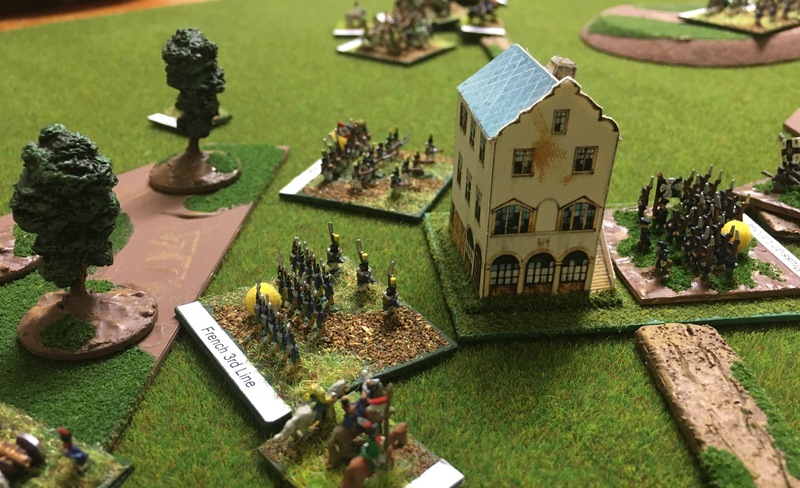 On the Prussian right Prussian infantry and cavalry of the Bulow’s III Corps launched a series of attacks on French troops holding high ground and extending to a wooded area. The battle here flowed back and forth until von Hessen-Homberg’s division turned the French position by its arrival late in the day. 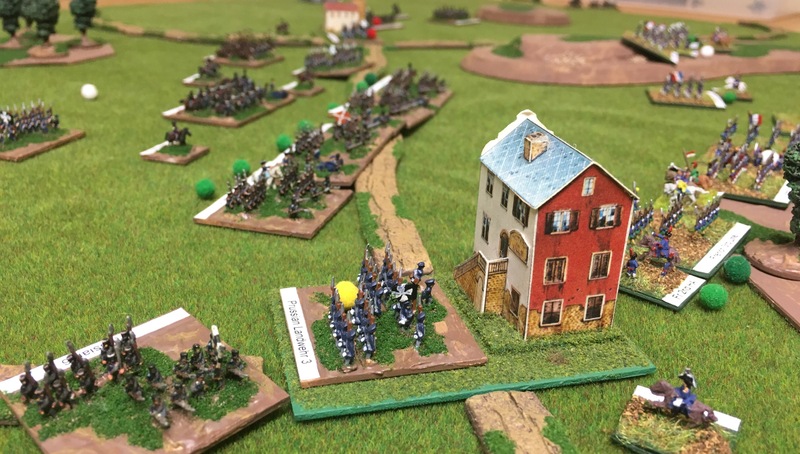 Below, the high ground on the French left with the Prussian attack gaining momentum. The French divisions on the left were forced back and were only saved by the arrival of two French cavalry divisions just prior to dusk. In this sector Prussian Landwehr cavalry, much maligned due to their lack of drill, launched a glorious and successful charge against the exposed flank of French artillery left unsupported by retreating French infantry. In the centre the initial Prussian attacks were launched against the small town of Dinnsdorf from which it was hoped the French centre could be unhinged. Two Prussian divisions formed up in a blocking position to the left of Dinnsdorf allowing 36 Prussian guns to bombard the French opposite. 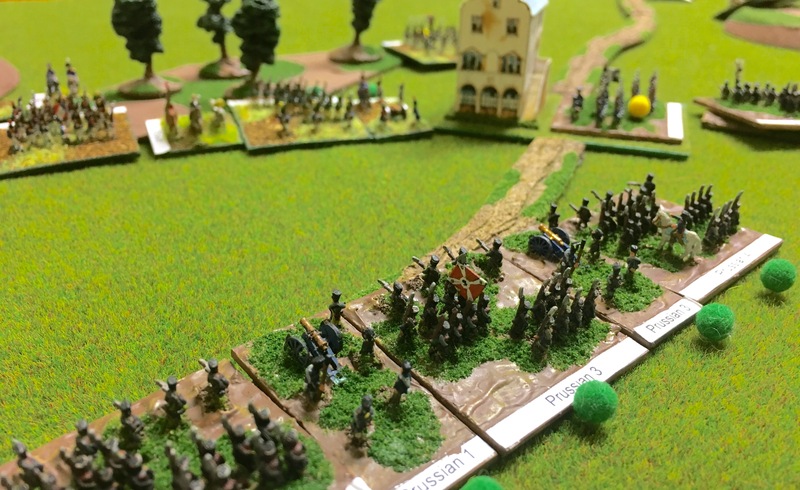 Below, Prussian cannon, supported by infantry, engage the French some 800 yards distant. Simultaneously two Prussian regular brigades Ziethen’s Division were thrown in to an initial attack against the French defenders of Dinnsdorf. Both brigades were thrown back while Blucher, ever in the heat of action was wounded in the encounter. Soon another attack was ordered and two further brigades, including one landwehr brigade, closed with the bayonet. The landwehr were successful and secured Dinnsdorf, as can be seen below. In the distance the town of Laswitz can be seen, as well as the dominating ridge on the French right. Of course the French commander could ill afford his army to be split and ordered a series of counterattacks. Over the course of two hours four French brigades were thrown at Dinnsdorf. Each attack was thrown back by the landwehr defenders, one of which is shown below. As darkness fell and after just five hours of fighting the armies disengaged. With the loss of Dinnsdorf the French centre was separated from its left and line of communication. Yet both centries remained generally fresh, though bloodied by the fighting for Dinnsdorf. The French left was hard pressed by the Prussians opposite, but Prussian casualties prevented any further exploitation. For the Prussians their own left had collapsed, opening up their own line of communication to attack, though again French casualties prevented any significant exploitation. Despite the tactical draw however the engagement will long be remembered for the brave and glorious actions of the Prussian Landweht, both on foot and mounted, which was truely glorious.